Because of Hurricane Irene, Stamp Camp Rescheduled and Brunch With Frances!!! Last weekend Christy one of my team members and I had scheduled a New Catalog Stamp Camp and guess what Irene decided we shouldn't have it soooooooooooo we rescheduled for this Sat 9/3/11 at 10a.m. so if you missed the date you still have time to sign up. Email me by 9/1/11 to reserve your spot. 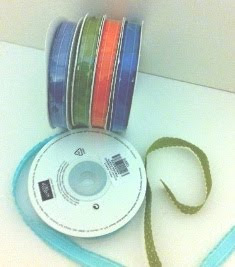 You will be making 8 projects for $25 including cards and 3-d projects. Tonight I am perusing the net to look for some new recipes to serve at my Brunch with Frances on (Sat)Sept 17th at 11:00am. 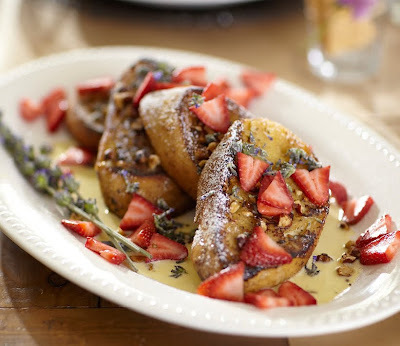 Doesn't this CUSTARD BATTERED FRENCH TOAST WITH GLAZED STRAWBERRIES AND NUTS look yummy!!! 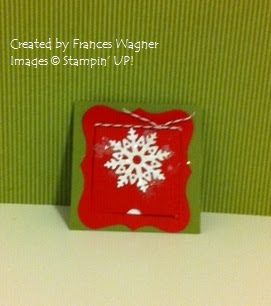 The recipe is on the Pottery Barn site and I thought uummm I bet my stamping friends would love this. So I printed out the recipe to go along with some other yummy goodies to serve at my Brunch with Frances. Don't forget to reserve your spot by 9/10/11. Your ticket to the brunch is a $150 order that you can place for yourself or you can gather orders from family and friends. What's in it for you!?! 4. You get a $25.00 shopping spree from the new catalog for hostess benefits! 5. 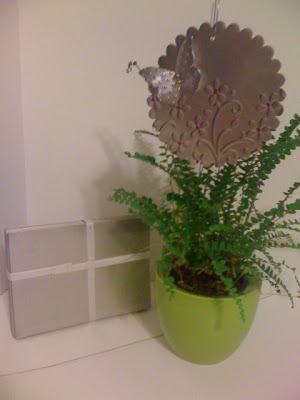 You will do a make and take and I will have projects to view from the Holiday Mini catalog. Bring your camera! 6. A great girls morning out. 7. Don't forget door prizes! 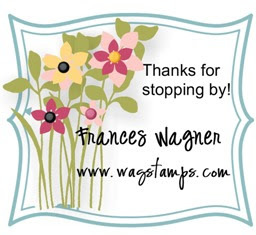 Saturday was such a fun day meeting with other demonstrators in the area and surrounding states for a Stampin UP Regionals meeting. A day filled with great ideas, make and takes and watching demonstrations from the home office including Shelli Gardner and area demonstrators showing us tricks and tips too. Below is Shelli Gardner Co-founder and CEO of Stampin UP. You could not meet a nicer person! I also got to meet one of my downline (this is someone that has signed up either under me or someone on my team). Teresa Plunkett is in my 3rd level and is so fun and very creative. It was great to finally meet her after a couple of years of being on our team. Looks like we dressed to coordinate but we didn't! :) I saw Margaret Grunsley who was a guest of another demo friend of mine. Great to see you Margaret! Karel was my guest and we both had a great time. I am looking forward to sharing these new ideas in upcoming events I will have on my schedule starting in September! Stay tuned, and thanks for stopping by! 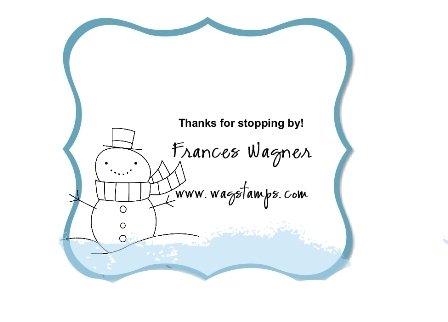 Last week I met with my new Christmas Card Stamp Club and we had a great time deciding what stamp sets to use and what colors to use for our Christmas cards this year. I have been playing around with this really cute NEW stamp set "Snow Much Fun". I haven't decided to use the vintage type colors or brighter colors. The colors I used are Cherry Cobbler, Always Artichoke, Crumb Cake and Very Vanilla. I hope you like it. Thanks for stopping by. Remember I have Stampin Bunco next Tues 8/23 at 7pm. We still have openings and it will be a lot of fun. 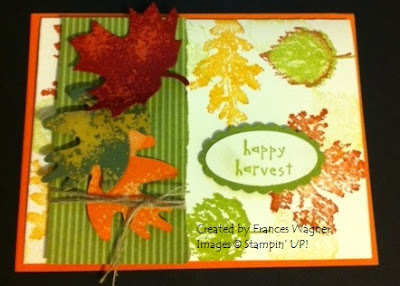 I am designing the fall card you will make this week. I thought this post needed a little color, so when I got my new stash of goodies from the Stampin UP Holiday mini catalog order yesterday, I thought I would make a little something. 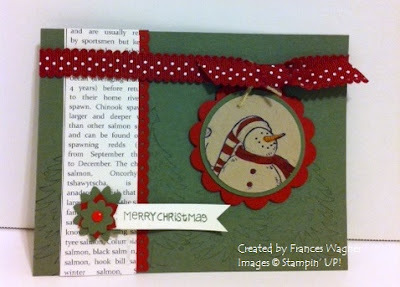 I can't show you the product till Sept 1st but I can show you this is a little tag I made using "Snow Much Fun" stamp set that is new in the newest large catalog on page 35. I just love that little bird making a snowball. 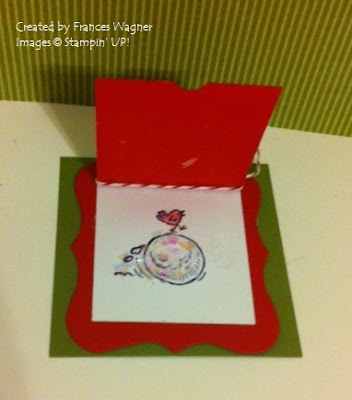 The new part of this little 3x3 card is that I used the new Peekaboo Frames big shot die. When you see it you are going to have to have it to go along with the samp set "25 & Counting". If you come to my Christmas Card Club on Friday night you can look at my new toys and the new Holiday Mini Catalog. I only have one right now but some are on order for you. I used the snowfake on front is from Northern Frost Snowflakes 120901 Sizzlits die strip page 225; Baker's Twine 123125 page 194; (NEW) Mica Flakes on the snowball. Don't you love the way the frame lifts up and you can peek at what is inside? Aug 12th: (Initial meeting): We will plan and design our card by looking at the catalogs and brainstorming together and deciding what colors, stamp sets, embellishments etc. you want to use. Whether you like snowmen, serious, religious, contemporary or whimsical, there is a stamp set for you. The first night you will place your order for your supplies. Also at this meeting we will agree on what night to continue to meet each month. Sept: (2nd meeting): We will cut all our supplies so bring your paper cutter and scissors and big shot if you are using any dies for your project. Jingle Bells, Jingle Bells............ ok I got a little carried away! 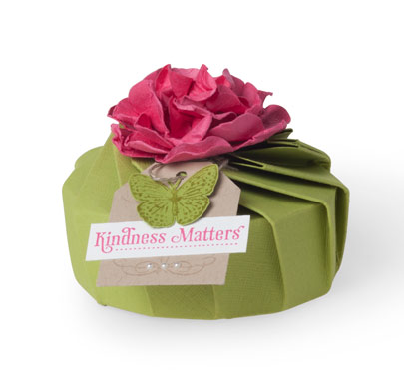 Promotion Details: During August, get a FREE package of Designer Series Paper when you buy three! Stock up on all your favorites, including brand-new designs from the 2011-2012 Idea Book & Catalog. There is no limit to the number of free packages of Designer Series Paper you can earn. At our stamp camp we will be making these metal garden/plant stakes that are so cute. We will be using our big shot to make it. This is just one of the 8 projects we will be making! Sign up today by emailing me and drop a check in the mail to confirm your spot. When you email me I will send you details. The state of North Carolina is having a sales tax holiday for school supplies up to $100.00 per item from August 5-7. Because school supply items are included in this sales tax holiday, the below list of items will be state tax free during the holiday period. You can order on line from my website or you can contact me to place your order but remember it is for a short period of time.